It’s official: Americans love scrapbooking. In fact, making a scrapbook was our first foray into the craft world. And we still make dedicated albums for all the major events and milestones that happen in our family. It’s the best way to preserve memories while also making beautiful art that you can savor for years to come. We’ve compiled this guide to everything you need to know about scrapbooking. Beginners, think of this as your Scrapbooking 101 class. And for those of you who are a little more experienced, we hope you’ll find some new inspiration and ideas in this guide. 4 So… What’s Digital Scrapbooking? Before we get down to the nitty gritty, let’s cover all the need-to-know details first. What actually is a scrapbook? We like to think of it as a crafty photo album. Essentially, it’s a collection of photos in a book that’s usually centered around one event or milestone — a wedding, for instance, or your baby’s first years. As well as photos, the scrapbook is decorated with mementos and artistic flourishes, as well as some journaling to narrate the photos. Like we mentioned in the introduction, it’s a way to preserve memories in an artful way. A time capsule from a major event. How you choose to scrapbook is entirely up to you. We like to include little sketches and paintings of our memories alongside our photos, while other people focus more on crafty presentation or the journaling aspect of scrapbooking. The best way to find out what works for you is to experiment and see what you like to do and what you think looks best. Later on in this guide, we’ll show you some beautiful layouts that might inspire you to create your own. So, what sort of thing can you scrapbook? We’ve compiled a list of different scrapbook ideas and scrapbook pages you might want to consider, but remember that this list isn’t exhaustive. If you can capture it in a photograph, you can scrapbook it! Friendships — a ‘highlight’ reel! Once you’ve got all the photos that you want to include, you’ll need to collect other memorabilia to decorate your scrapbook pages with. So now that you’ve collected all your photos and memorabilia for your scrapbook pages, you’re probably wondering how to make them look pretty. Of course, this is where crafting comes in. If you’re wondering where to find scrapbook ideas, your first port of call should definitely be Pinterest. This site is an absolute haven for all things crafty, and we’ve found more ideas for scrapbook pages on here than any other blog ever. If you really want to take your scrapbooking to the next level, we’d definitely recommend taking a specialist course in the craft. These online courses will teach you the skills you need to become a pro scrapbooker — we’ve taken a few of them over the years and have found that they’ve been the key to developing new ideas and just generally making more beautiful pages. OK… now you’ve got some idea about how to scrapbook, you’ll need to get yourself kitted out with a whole host of supplies. But before you go buying up the entirety of Amazon’s craft stock, we recommend first buying the essentials and then adding to your supplies slowly. One of the best things about scrapbooking is that anyone can do it, regardless of budget. You only need a few low-cost items to get started. As you spend more time with it, then you might want to consider investing in more professional equipment to take your work up a notch. But there’s plenty of time for that. In the meantime, we’ll run through the essentials, plus a few extras that you might want to consider. Scrapbook paper is probably the most important tool in your arsenal when it comes to scrapbooking. You can’t do too much without it! You can buy all sorts of plain and patterned paper at craft stores both in store and online. You can also find a huge amount of scrapbook paper on Amazon — and they’re often included in some good deals too. Another must-have in the world of scrapbooking is the album itself. You can buy some absolutely beautiful scrapbook albums online, although if you’re on a budget, you can easily buy some cheaper ones. Personally, we tend to stick to buying the cheaper versions and beautifying them ourselves! The scrapbook paper and the album are usually the major purchases — or at least the ones we buy most often when it comes to our scrapbooking. There are other little things that you’ll need as well, although you may have some of these stored in your craft room already! 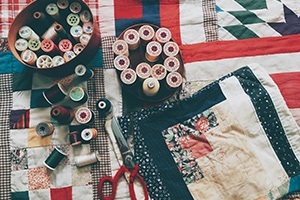 Now that you’re stocked up on all your essentials, you may want to look at some of the products that can help you take your scrapbooking to the next level. Remember: these aren’t essential and won’t be suitable for everyone. Only the most dedicated scrapbookers need apply! Everyone knows that the biggest star in a scrapbook is always the photos. After all, the entire scrapbook should be based around the photos, with everything else only there to make the photos look beautiful and in their best light. So it makes sense that having a good photo printer will lead to better photos and therefore, better scrapbooks. Ideally, you need a printer that’s capable of printing photos that won’t fade over time — this is why your normal household printer probably won’t be up to the job. The best photo printer will print photos that will look and feel as though they’ve been developed professionally, without you even needing to leave your craft room! These don’t come cheap. You should think of them as an investment into the longevity of your scrapbooks. Maybe add them to the Christmas wish list! This Canon Selphy is one of the best photo printers on the market right now. You can connect to it via WiFi and upload photos to it straight from your phone — it’s seriously easy to use! Plus, it’s not too expensive. If you’re looking for a photo printer that’s ultra portable and perfect for scrapbooking, the HP Sprocket might be the machine for you. It’s certainly small but it will create beautiful 2″ x 3″ snapshots on sticky-backed paper that you can simply straight into your scrapbook. There’s also a brilliant HP Sprocket app that you can use to customize and edit your photos beforehand. If you’re looking to spend some serious cash, you can’t go wrong with the Canon PIXMA Pro-100. Unlike the portable printers we’ve profiled above, you can print really large photos in truly excellent quality — up to 13″ x 19″. The color of the print is true to the original photograph, and it’s no wonder that the PIXMA Pro-100 is a favorite amongst photographers as well as scrapbookers. 4800 x 2400 dpi with fine technology — so much detail! Most of you will start off buying embellishments for your scrapbook, but eventually you’ll probably want to start making your own. The way to create these beautiful shapes is using a die cutting machine — a machine that uses steel cutting dies to cut certain shapes into thin materials, like paper, foil, lace and much more. Particularly sophisticated die cutting machines — more commonly known as craft cutters — will be able to cut shapes out of a huge variety of different materials and won’t require the use of dies to do so. Instead, you will be able to design your ‘cuts’ on specialist computer software which the machine will cut automatically. A lot of people — including us — use their die cutters to make vinyl decals and stickers to add to our scrapbooks too. The Sizzix Big Shot is a real cult classic die cutting machine that has got thousands of die hard fans behind it. It’s incredibly easy to use, and allows you to both cut shapes and emboss onto a variety of thin materials. The machine is compatible with a huge number of different dies so you can truly create any shape you want. The Cricut Cuttlebug is very much like the Sizzix Big Shot and is another simple die cutter. It promises to work with a wide range of materials, including tissue paper, foils, acetate ribbon and even thin leather — great news for experimental scrapbookers! It also comes in a lovely mint color. The Cricut Explore Air 2 is the latest desktop craft cutting machine that goes far and beyond what the Sizzix and the Cuttlebug can do with die cutting. Firstly, it’s a computerized machine that you can hook up to the smartphone app, your tablet or computer. You can create your own designs (or buy them from the store) and the Explore Air 2 will automatically cut them for you. It can work with over 100 different materials and can basically cut whatever you design. It can also write at the same time as cutting — great news for scrapbookers who like including quotes or who don’t like to do their own calligraphy. It’s a brilliant machine. You can read an in-depth review of it here. Phew — that’s it, that’s all the scrapbook supplies you need to get started on your crafting journey. We’ve got to be honest… we’ve only ever done traditional scrapbooking. In fact, we’d never even heard of digital scrapbooking until we started researching for this post. Well, it’s exactly what it sounds like. Digital scrapbooking is done on your computer — usually with some specialist software — to create a virtual version of a ‘normal’ scrapbook. This obviously makes it super easy to use digital photos in your scrapbooks, and you’ll have to scan in your other keepsakes and memorabilia you want to include. And, of course, you can print them out at the end if you still fancy having something to hold and store in your hands. There’s plenty of free digital scrapbook software to choose from online, while you can also use professional software like Adobe Photoshop if you’re feeling confident at creating your own designs from scratch. OK… now that’s everything you need to know about scrapbook ideas, scrapbooking supplies and everything about how to make a scrapbook.